Who can resist the ruffles? This gather belt feels like more of a bedroom accessory than a casual piece of lingerie, but its ability to hold up stockings is rather good. If you want something more subtle than a regular gather belt, this one surely deserves a try. Rating this garter belt was not easy. On the one hand, I'm not exited about it, but on the other hand, I haven't actually tested it enough. Also I couldn't find any serious disadvantages to give it four stars, so let it be five. -it is made in China. The Chinese origin may frighten some of you as sometimes people tend to associate it with a poor quality. I'm glad to reassure you that quality of this belt is quite good. I couldn't find any flaws and—trust me—I'm a very picky customer. The design of this belt is rather unusual for a garter belt, but pretty simple. 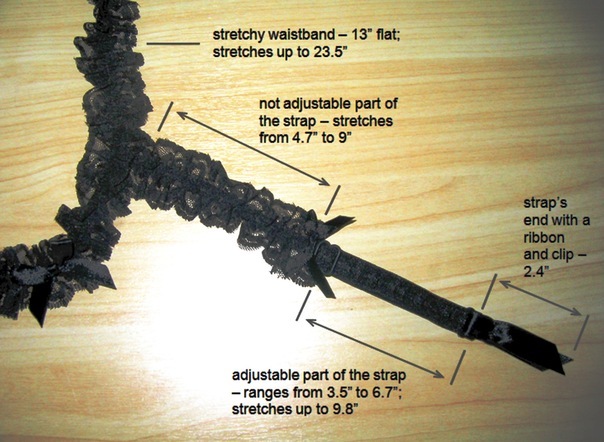 It is much smaller than regular belts and is made of beautiful black lace. The lace is very soft and didn't really bother me, but I assume that it might feel a bit itchy for some. There are five small bows: one small in a front and the other four on each of the adjustable garter straps. The waistband is not adjustable, but is really stretchy. I wouldn't recommend stretching it too much, though. Despite the quality being good, the construction of this belt is quite delicate. As for the clips, they consist of two parts—silicone and plastic—which are hidden under the small ribbons. At first I have found this belt a bit awkward. I like things fitting me perfectly, being tight enough when it's needed. Therefore, I would also like to feel that my garter belt is holding up the stockings strongly. The ruffle garter belt gave me the impression of a purely decorative accessory, which is not practical at all, but good enough for the bedroom. However, some more "trying on"s showed that it can actually hold up your stockings well enough and is rather comfortable at the same time. The good thing is that you can place it either on your hips or on your waist, depending on the height of the stockings and other factors. As for me, it sat perfectly well on both my 24.5" waist and 36" hips. Unfortunately, I haven't tested this gather belt in the bedroom or outside yet. I promise to add more about my practical experience in the follow-up, though. Well, finally this garter belt received some proper testing. My review lacked the information about its performance during the actual use, so here it comes. Ruffle garter belt by Coquette didn't disappoint me at all. It turned out to be almost invisible under clothing and held up my stockings quite well. I was wearing it under a very tight and rather thin knitted dress and it wasn't visible more than, for instance, my tights normally are. With a looser outfit it was all the more discreet. During the day some of the clasps can accidentally open, but it happened maybe 1 or 2 times with me. If you want to be more confident that your stockings aren't going anywhere, you should probably try one of those belts with 3 pairs of straps. However, the one EF offers here would be much more visible under clothing. Overall, I still like this garter belt and due to its good quality I see my "relationship" with it pretty long-term. Thank you for viewing Ruffle garter belt review page!